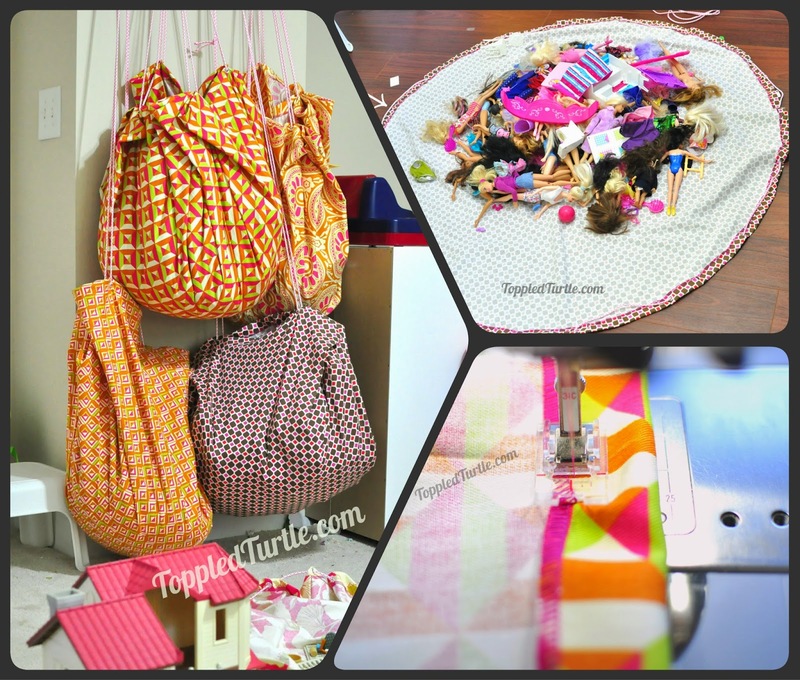 In this step by step cinch bag tutorial, I'll show you how to create easy cinch bags for DIY toy storage that also double as a play mat, making play and clean up a breeze! My kids have too many toys! When I was younger, I remember my brothers had an amazing Lego collection. It wasn't their Legos I admired, however, but the storage bag. It was made of denim and rope. Whenever they wanted to play, they just pulled the bag down, let it fall open, and they had a ready-made mat. No pieces all over the floor, no hours of clean up. When they were done, they just pulled on the rope and hung the bag back up. 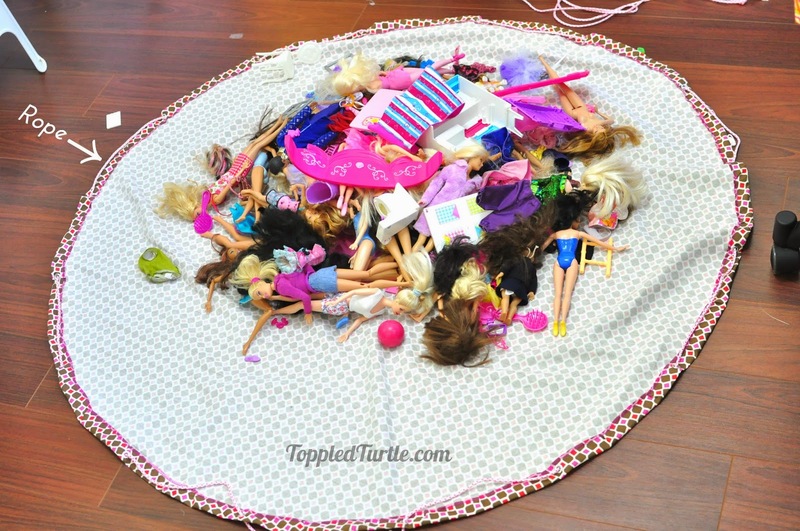 My sisters and I were not so lucky, spending hours cleaning up Barbies and other various toys with miniature pieces. Now that I'm an adult, with kids of my own, I covet that play mat bag all the more! So, this weekend I set about making some for my girls to make play and clean up more enjoyable. I made some mistakes with my first attempt, but in the end, we have 5 great bags and a clean room! Let's discuss the rope for a minute...hubby bought the rope I used in this project at Home Depot. I used 2 bag's worth to make 5 cinch bags. I tried cording rope (from fabric store) for my trial and quickly discovered it was just too "sticky." 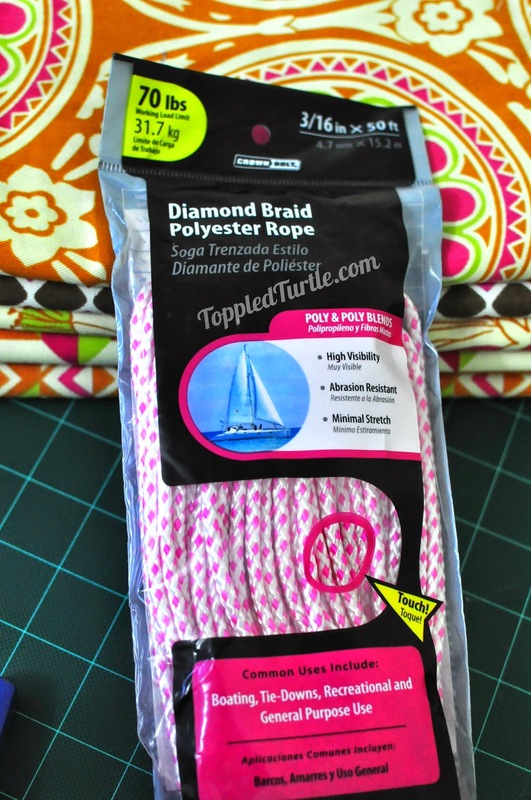 This alternate rope is nice and smooth making it glide nicely for easy, kid-friendly cinching! The bonus is the price: $5 for the bag! Ok, let's discuss the steps involved. A semi-circle unfolded = CIRCLE! 4. You now have a perfect circle (note: if you've ever considered making a circle skirt, you're halfway there already! 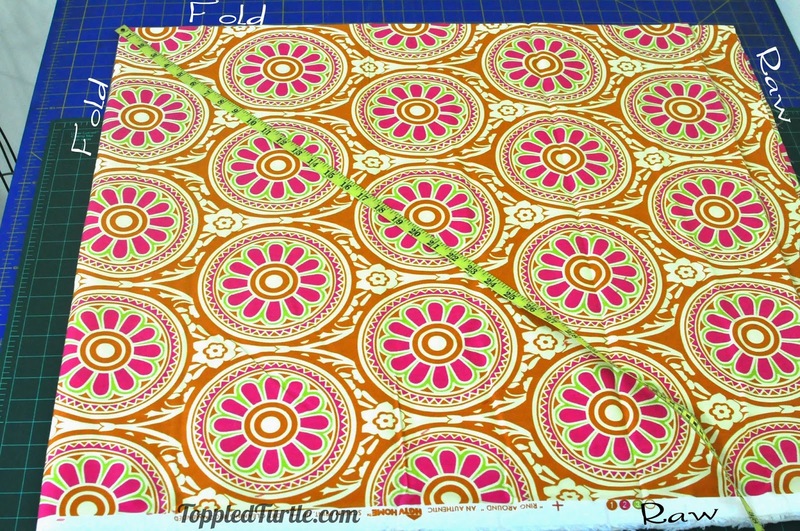 Just cut a smaller circle from your corner fold, serge, hem and done! There's math involved for that center circle and I love this little tutorial for it). Whoa! Off course! Sorry! 5. 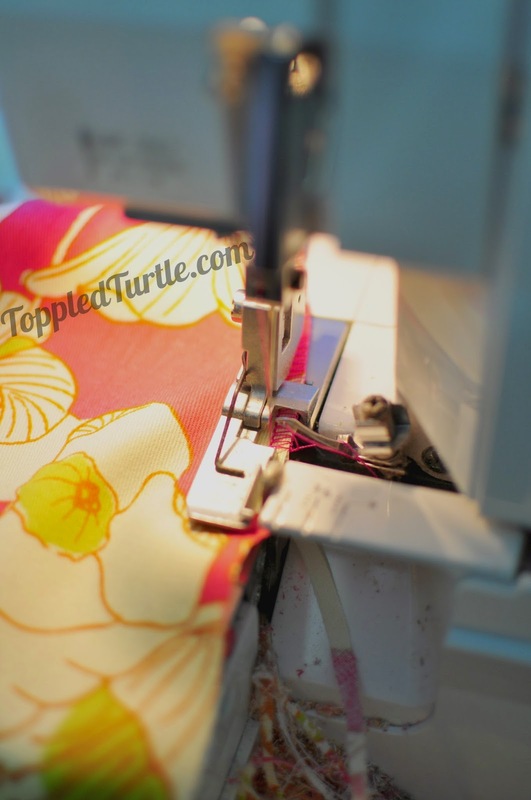 Run that perfect circle through your serger. Don't have one? 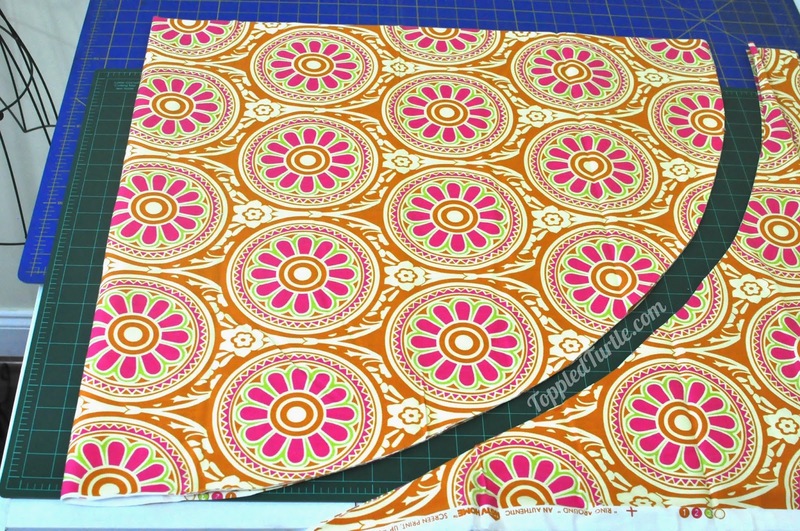 Don't fret, run a zig-zag stitch along the inside edge or use pinking shears to make your original semi-circle cut. you want your bag to last, right?! My mannequin got a workout! 6. 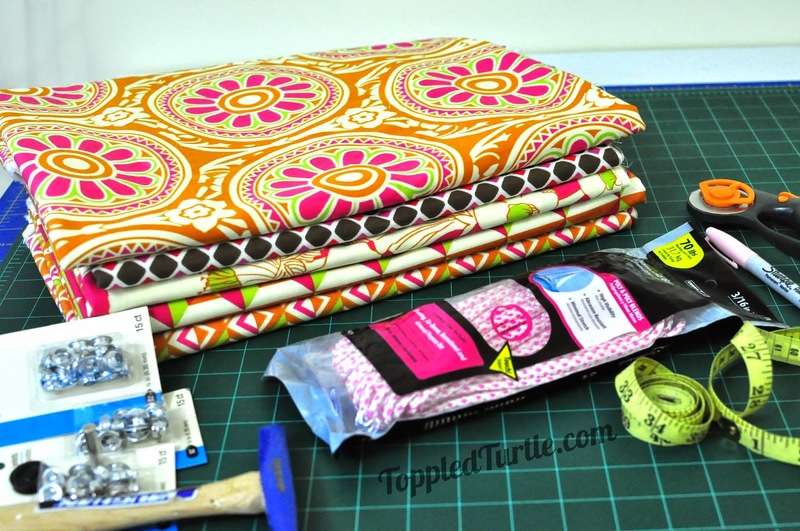 Fold over and sew approx. 1" hem around the entire edge. You can be a perfectionist and press first, but who has time for that? 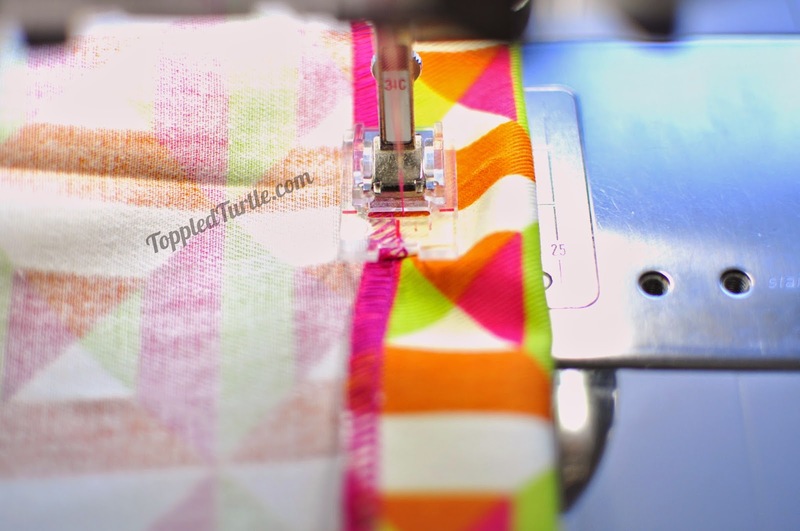 Since you're sewing around a circle, you will need to allow for a fold in your hemline to account for the difference in circumference from outer edge to your sewing line (1" in). 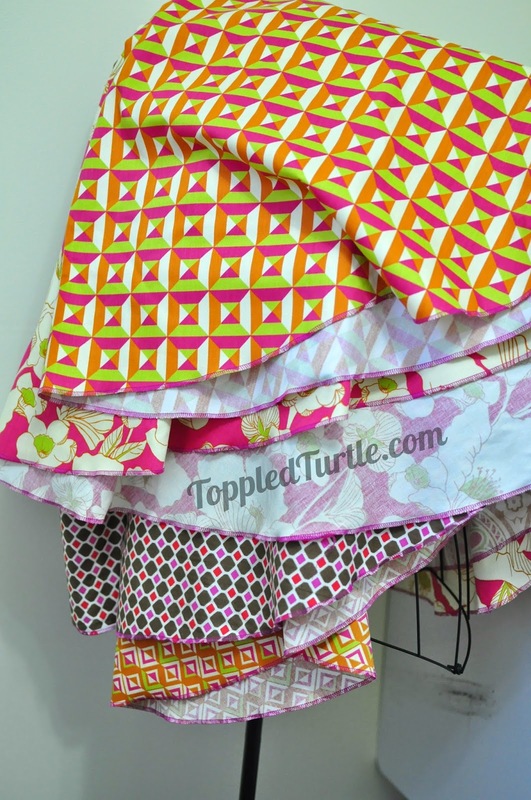 Just allow the fabric to fold over itself every couple of inches to accommodate this. It's really no big deal - don't let it stress you out! See the pucker building up? Just fold it over itself and sew right over it. See, it's ok! 7. Eyelet time! You're almost done, though this is, admittedly, the most tedious part of the process. 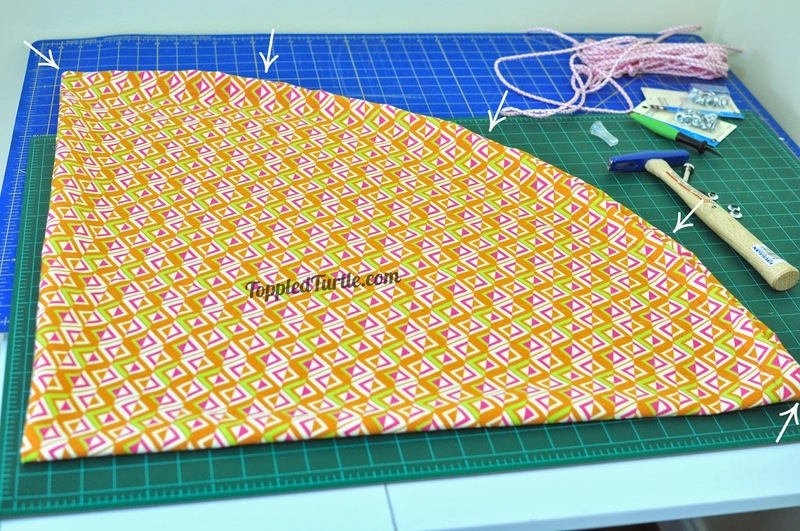 I found it easiest to quarter my fabric again rather than measure all the way around the circle. 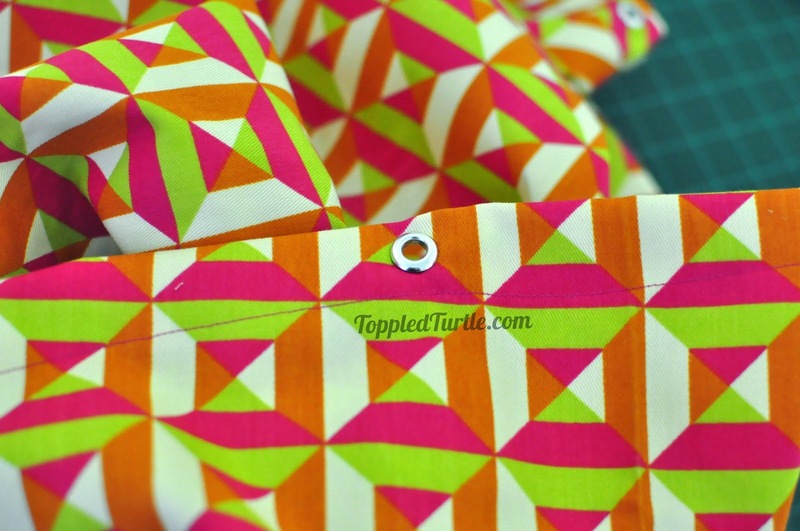 With the fabric quartered, mark each fold as an eyelet location. Then, measure approx. 10" away and mark, marking every 10". I say "approx." because this will depend on your exact circumference. Mine had about an inch extra that I just spread out between each placement. No need to get out the calculator or complete advanced calculus - approx. is just fine! 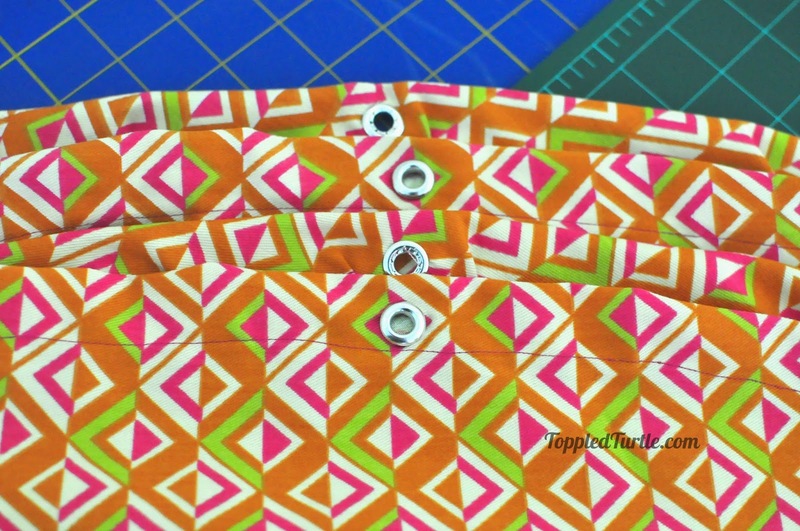 The arrows indicate where the eyelets will go. 9. Thread the rope through the eyelets. If you've done it right, there should be the perfect number that both ends come out the same direction. Be sure that there is enough rope that the circle can lay open flat (this is the play mat, too, remember!) and secure the ends together. 10. Load up the toys! 11. Pull up the rope from opposite sides of the circle to cinch and you're all set! 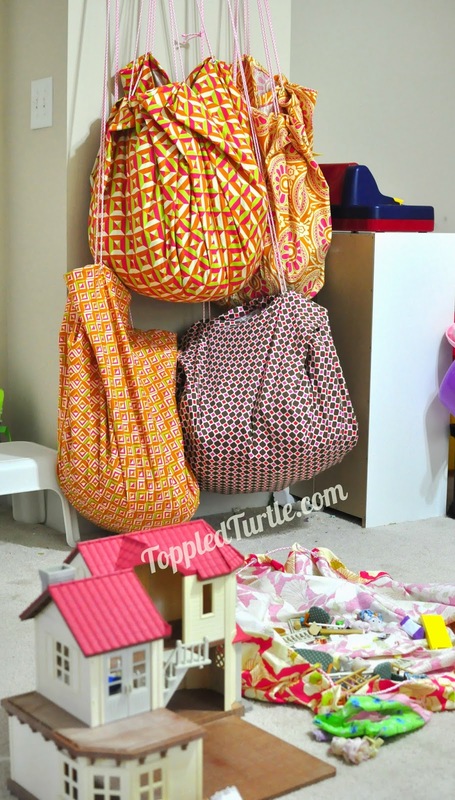 Play, cinch, and hang your way to a cleaner play area! I hope you've found this blog useful! I love comments and reply to questions when asked, so ask away! Best of all, enjoy your clean play area!